Oreo hosted a Trending Vending Lounge at the South by Southwest (SXSW), an annual music, film, and interactive festival held in Austin, Texas. 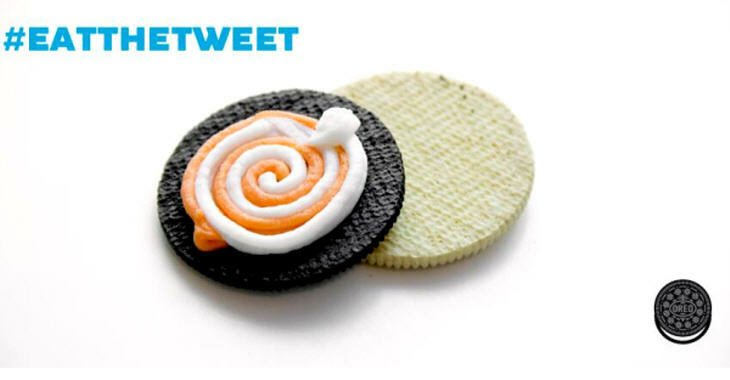 The Trending Vending Lounge had specially-made 3D printers so fans could customize their Oreo cookies. The Trending Vending Lounge was designed as a space that will deliver "deliciously hyper-personalized and customized snacks based on real-time data collection," said the team at Mondelēz International, the owner of Oreo. Mondelēz partnered with Twitter to discover which twelve flavors were trending. Users could browse a selection of the trending flavors displayed on a large touch-screen panel. The twelve flavors included gingerbread, birthday cake, lemon, peppermint and more. The available cookie flavors were vanilla and chocolate. The 3D printers were created by MAYA Design and took just 6 weeks to build. The food-grade 3D printer extruded cream in one of four patterns: bull’s-eye, pie shapes, stripes or swirls. The nozzle extruded about two millimeters of the selected flavor onto the cookie, and then filled empty spaces with white cream, designed for a perfect cream-to-cookie ratio, or 6.8 grams of icing per Oreo cookie. The cookie and cream is topped with the second cookie to complete the Oreo. The whole process only takes about two minutes. For more information, follow the conversation at #eatthetweet on Twitter.